Fans at Ransomville Speedway get very close to the action. The reaction to last year’s visit to Lancaster Speedway on this website was relatively overwhelming. Those in the auto racing community were pleased that a novice had taken the time to see what all the noise on Saturday night was about, and I appreciated their kind remarks. The difference is the dirt. There’s no pavement in sight once you get off the main road approaching Ransomville. The Good Earth is the star of the show. It didn’t take long to jump to one conclusion. The gates of Ransomville lead to a different world than the one in Lancaster. Even the t-shirts at the two tracks have a different look – one sleek and clean, the other old-fashioned and busy. Let’s sum it up this way – I didn’t take any surveys at Ransomville, but I had the distinct feeling that a “Hillary Clinton for President” t-shirt wouldn’t have gone over well. We walked into the facility surrounded by people in costume. It seems it was Halloween Night in July, so some children showed up in costume. The marketing department obviously has been paying attention, because attracting children to auto racing is the best way to ensure a future for the sport. I would guess somewhere around 1,000 people turned out on a Friday night, although that’s only a consensus from the guesswork of Team Bailey. I think I was the only person in the grandstand with a collared shirt, meaning I had overdressed for the night. Oh well. The ticket price for general admission is $15 for adults (more for VIPs/pits), with discounts available. We had the classic burger/fries/drink combination for dinner at the concession stand, and there was general agreement that the food had more taste than we expected. So, a thumbs-up to the chef. While eating, I looked out to see a couple of trucks watering the track – raising my first question of the night. “Why?” It turns out that the idea was to battle the dust, a valuable clue as to what would happen the rest of the night. Then, just about exactly on time, we were set for some dirt-track racing. About 10 cars came out for the first heat, and we were off and running for the night. The sight of the cars took some adjustment for this novice fan. The cars speed into the corners, where they seem to spin around the turns as the back end flies off toward the wall a little bit. Steering those vehicles must not be for the faint of heart or the weak. Extra care is given to the right rear tire, which takes quite a bit of abuse. As the first heat ended, the cars needed a half-lap to slow down. Then they lined up to drive off the course to the pits through an opening in the track on the backstretch. At the same time, the next group of cars was coming on to the track. In other words, there wasn’t a dull moment during the first part of the program – something was always happening. – I was told that most dirt track drivers stay on the soil to race, while the ones on pavement stick to the roads. There’s less crossover than you might think. And while most drivers are men, a few women have joined the fraternity. Good for them. – Ransomville has a moat of sorts between the fence on the front straightaway and the high wire fence designed to offer some protection to the fans. The moat expands in size in the first turn, as it helps protect the parking lot area from, um, unexpected visitors. It’s interesting that Lancaster has some foam up on its course, while Ransomville sticks to the concrete walls. You do hold your breath a little longer after an accident when the foam isn’t up. – According to the program, a handful of cars and drivers cross the Canadian border to come to Ransomville. Come to think of it, a different but almost equal handful came up from Erie County. 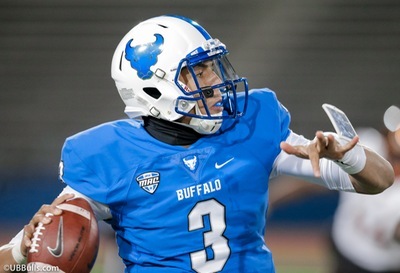 This is a Niagara County product. – “The Big R” has a handy video screen that visible throughout the grandstand. There’s no time to watch it during the racing, but it is very useful to see what happened via replay during incidents in a race. – Speaking of incidents, my eyes raced to one of the poles to look at the “traffic lights” to see if the yellow light was on to indication the race was under caution. The traffic light looked as if it were acquired at a sale at the Ransomville Town Hall. It was rather charming in an odd way. – I’d be happy to explain the point system involving heats, but when I asked it sounded as if that was about as simple as the NFL’s quarterback rating system. – A tip of the hat goes to Miss Ransomville, Mariah Reilly. She seemed to pop up throughout the night in a variety of ways, proving that her job is not merely a ceremonial one. By the way, her grandfather used to race in Lancaster in the late 1960s and 1970s. – Granted, auto racing is a noisy sport, and it’s pointless to yell and clap while it is going on. Still, I was a little surprised that there was hardly a cheer from the crowd after each heat ended. My surprise is probably the novice in me speaking, as the applause picked up after the end of each feature race. 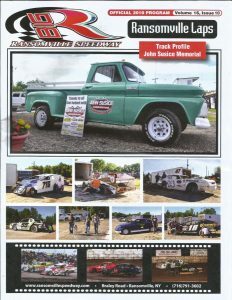 – Let’s congratulate the winners of the feature races on the night: Cory Sawyer from Niagara Falls in Street Stocks; Allan Wills of Ransomville in Modifieds, Garrison Krentz of North Tonawanda in the Sportsman; Chad Desso of Wilson in the 4 Banger; and Brian Monahan Jr. of Ransomville in the Novice Sportsman. You’d have to say Ransomville did quite well for a town its size on this particular night. – I’ll mention here that the people from Ransomville Speedway couldn’t have been nicer to me and my group throughout the night. The racing community has good folks. 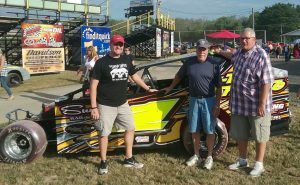 Team Bailey received a warm welcome at Ransomville Speedway. You didn’t have to be A.J. Foyt to figure out something was up with the track surface. A crew was working on it for an hour between the end of the heats and the beginning of the feature races. The fans were relatively patient, but still it wasn’t a good situation. Then the racing started, and the dust became an increasingly big problem as the night went along. We could see drivers and mechanics checking out the surface across the infield between races in order to prepare their cars properly. By the fourth feature race, the dust was so thick that we could not see the cars clearly in the turns. If we looked up, we could see the dust billowing – a word I only associate with the smoke of a fire – up into the atmosphere. It must have been somewhere between difficult and scary for the drivers. It wasn’t a typical night at the track in that sense; you may have noticed that it’s been a dry July. Our group had to leave about then anyway, and I coughed a little as we headed for our truck. On the way out, we noticed how the dirt had collected on the vehicles of the fans … and how some of the other fans had parked as far away from the track as possible to ensure a quick exit with a clean car. A helpee-selfee car wash in that neighborhood might do a big business several nights a year. Despite the dust, Ransomville puts on an entertaining product. My uneducated eye liked the racing on dirt better than the action on asphalt, and the night felt authentic. It was an educational, fun evening for a reasonable price.